This Cranial Flap design is one outcome of the EC-funded Custom-IMD project which involved 22 partners from seven European countries, working to achieve an integrated supply chain for the design and manufacture of fully patient-customised cranial, dental and spinal implants. Typically cranial flap implants are made from titanium which although biocompatible has the drawbacks of being much stiffer than bone and being temperature conductive, which can be uncomfortable for the patient post-surgery. The above design is built in PEEK plastic which when built in a suitable lattice structure, closer matches the characteristics of bone and also has a high melting point and so accommodates all methods of sterilization. Within’s role in the Custom-IMD project was to design a cranial flap in PEEK plastic material with a complex structure that promotes osseointegration while also allowing the implant to be patient-specific, taking into account the dimensions and local stresses specific to the patient’s skull. 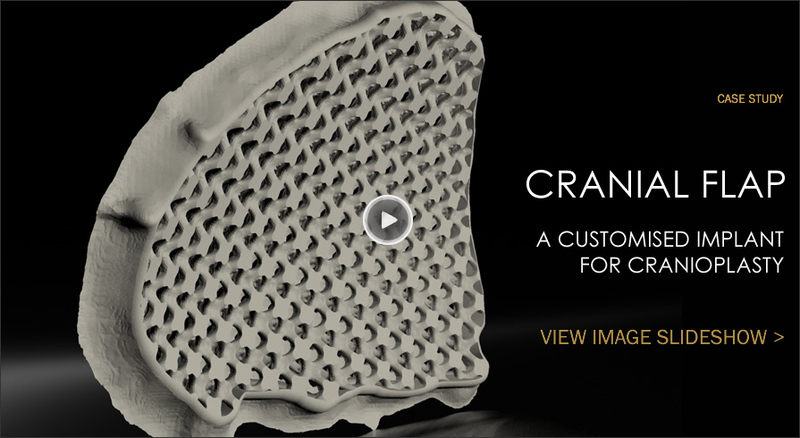 This individualisation of treatment achievable rapidly and economically through the use of Autodesk Within’s software and Laser sintering contrasts with the costly and lengthy manufacturing times of the typical mass produced titanium implant used in cranioplasty. Applying their expertise in Finite Element Analysis and the signature optimisation tools available in Autodesk Within, the team also added a rim around the edge of the implant to reduce stress peaks in the design and provide an optimum fit to the existing skull bone. The Cranial flap underwent further mechanical testing, which confirmed the end result was a strong functional implant. The finished structure was coated with a hydroxylapatite bioabsorbable filler to stimulate bony ingrowth.